Superman is flying north with Jon. The youngster, fearful of the Justice League's intentions, is shaking though Clark is unsure if it's the cold or his son's fears. He explains the League are uneasy with a new Superman replacing their fallen colleague but a distress signal interrupted their meeting and to prove his intentions Clark told them he'd handle the emergency alone, with Jon along as a student. 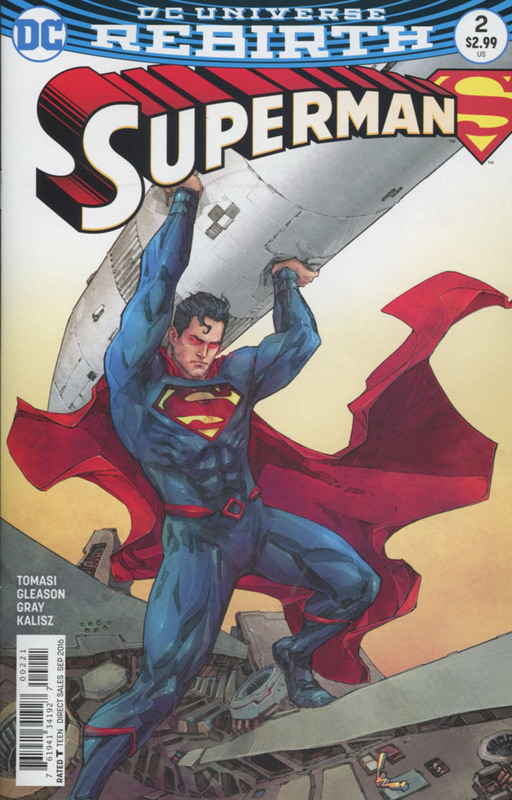 A submarine and its crew has become trapped, so Superman frees it and helps the crew to land after repairing their damaged propeller. He makes a point of letting the captain know he is aware of their nuclear cargo. All seems calm until a giant squid attacks the submarine, a coincidence considering their deadly and valuable cargo? Superman wastes no time in freeing the sub so it and the crew can get away but the creature's tentacles begin to overwhelm him. Discovering a kind of mind control unit attached to the creature Clark uses this opportunity to teach Jon how to use his heat vision. He instructs Jon to fire a concentrated beam to destroy the unit and the unsure boy tries but the radius is too wide and he scalds Superman's back. Superman encourages Jon to try once more and Jon is determined to succeed. He rips open his jacket to reveal his very own Superman T-shirt and tries once more, this time succeeding. The creature pulls back and escapes to the oceanic depths. Jon is puzzled as to why they don't pursue it but Clark explains the creature was manipulated against its will to try and steal the sub's cargo, a pawn in an unseen force's plot. As Jon and Clark land on the ice, Clark questions Jon on his choice of shirt, does he want to be Superboy? Jon explains he'd seen many kids sporting Wonder Woman's symbol and he simply wanted to be super like his dad. Clark explains that someday soon Jon might want to, might even have to, embrace the shield but he has to be more confident, strong in character and belief. Jon guiltily admits to his earlier heat vision outburst that ended with their pet cat dying. Clark reveals he knew Jon had used his powers as he noticed the faint smell of ozone the power emits. Jon tells his dad it was an accident as he was trying to stop a hawk's attack and he hid it fearing his mother would be angry. Clark tells Jon he thinks Lois would be proud that he came forward and told the truth but they'd only find out by telling his mother himself. As they soar back to Hamilton County, they don't notice that Jon has cut himself on the ice. The drip of blood begins growing sentient through some unseen alien technology and it deduces the DNA is half human, half Kryptonian and originating from the El family. Later, back to being the Smith family, Lois & Clark have a heart-to-heart while Kathy Branden & Jon do the same. Lois reassures Clark that Jon has a head start compared to when Clark was growing up. As a boy Martha and Jonathan had to deal with Clark becoming 'Super' while trying to give him as 'normal' an upbringing as possible and Clark had no idea what was happening to him. This time he has the best of both worlds in Lois & Clark, they can bring him up this time knowing exactly what to expect and better still Clark can help him control and hone his powers as they emerge. Meanwhile Kathy and Jon are bonding. The two children sitting on a tree branch looking out to the fields talk about secrets and Kathy tells him she can tell he has a good heart but as she rests her hand upon his he nervously clenches his fist which breaks the branch and sends Jon headfirst to the ground. As 'Lois Smith' examines a package sent by Lois Lane, Kathy and her Grandpa, Cobb, bring in an unconscious Jon. Clark and Lois tend to the boy and though Cobb offers to drive them to the hospital, Clark snaps at him. Lois softens the snipe offering thanks and that Jon will call them once he has some rest but once the door shuts her reporters instincts kick in. Clark tells her he has scanned Jon with his powers and aside from a mild concussion Jon is fine. Lois is unsatisfied and asks how, if Jon is super, he can cut open his knee and suffer a head injury, yet be immune to fire and be able to fly? Clark, feeling a little overprotective of Jon tells Lois the only place that offers any answers is the Fortress. At that moment however the Fortress recognizes Kryptonian technology approaching and allows it entry. The tech is an orb of some kind that detects some of Clark's DNA on his spare spectacles and absorbs it, evolving into a new form - the form of the ERADICATOR! Story - 5: Continuing the family drama, Clark and Jon share an adventure and though Jon is seemingly more childish than he is in Action Comics the scene where Clark teaches and reassures his son is pure Superman. It's just not a scene I can see playing out with Bruce and Damian for example. It works on a fundamental Superman level and explains his very core personality and upbringing. Jonathan and Martha might not be around but Lois and Clark are hitting the beats of their personalities perfectly. I know the cat scene last issue divided the readership but I'm glad it was addressed quickly and was turned into a life lesson rather than a 'shock' moment. I also like that though last issue was from Jon's point of view with a sort of ominous darkness and the examination of lies, this issue revealed that Clark is intelligent and knew and understood what was happening and was able to diffuse the situation. I can't express enough how much I'm enjoying the balance of drama and action as opposed to just action. Clark, Lois and Jon would NEVER have seen the light of day had the New 52 remit of no happiness and no long term relationships continued and the strength of this book is that a modern book CAN be happy, it CAN focus on relationships and still be a fantastic read. I would like to vote for a little more Lois Lane though! I am not sure yet how Kathy and Cobb Branden fit into things but Kathy hints at secrets and seems to be a good influence on Jon so far, so I'll reserve judgement on the mysterious neighbors. Art - 4: I'm loving the art, though occasionally the eyes are a bit too cartoony rather than expressive for my personal tastes and the action scenes rely a bit too much on 'heavy' inking thus lacking a little detail. Just to illustrate the point, take a look at Superman on pages 6 and 13... Is Superman wearing black underpants or is there a Nightwing/Grayson fear going on? I like that the drama scenes are dynamic and aren't left 'flat'. You can see Gleason is putting in overtime to make the book look great but I would like a little more detail on the art on a pencilling level not in composition, but on the finer lines. 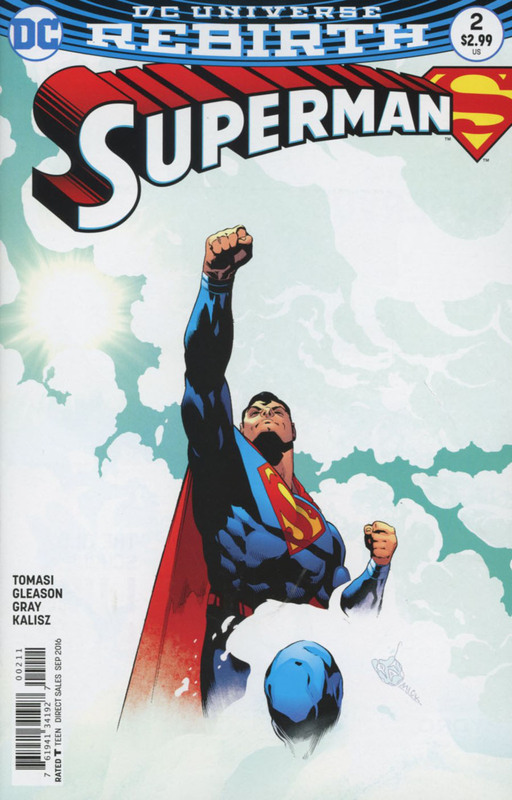 Cover Art - 4: Superman soaring up through the clouds can look amazing. This does have an 'epic' feel to it but that same feeling of 'lack of detail' is present. The clouds just seem to give it a feeling of being 'unfinished', which is a shame as this image could be amazing in the same way Superman with a perched eagle or breaking out of chains can be. Variant Cover Art - 4: In contrast to last issue's variant by the same artist, we get another anatomic variation of Superman, this one seems much closer in style to the interior art and in keeping with the new Superman than last issue. My problem this time is the coloring. With only one shade of blue the suit seems really bland. Is it lit too brightly? Is the suit literally one shade? I think if there was a little hint of a few more shades of blue it wouldn't have looked so washed out and yes I know it is a watercolor wash.